If you have been reading my blog you’ll know I’m a big fan of Talenti gelatos, having reviewed their products here and here. One of my favorite flavors is Mediterranean Mint, but I have eaten that so many times and felt like getting something new to review. I selected Peppermint Mark because I thought it would likely taste similar, while giving me the opportunity to try a new product. I didn’t quite understand the naming until I did a Google search and discovered “peppermint bark” was a traditional candy consisting of peppermint candy (candy cane, etc.) pieces embedded in a ‘bark’ of white and dark chocolatess. I have never eaten it so cannot say whether it is a fitting name. The base ingredients are pretty much the same, but I can’t see how the texture is even close. This gelato has an extremely fresh mint taste, backed up by a nice portion of irregularly-shaped chocolate chips strewn about. The experience of eating this pure white cream is quite different from the light green colored Mediterranean Mint because of the color difference, but the actual test is very similar. As I said in the intro, this pretty much lines up with my expectations. The only difference I detected was a slight graininess in the texture (maybe that is supposed to represent the ‘bark’), but it could be my imagination. Until I try these two back-to-back I won’t know for sure. 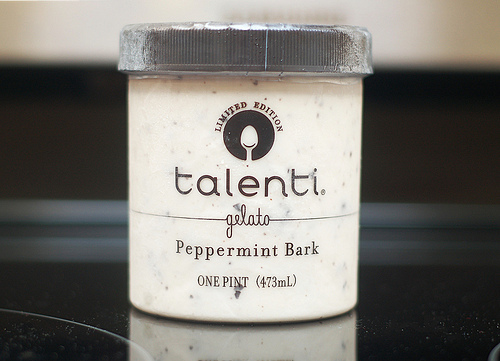 In a 100 gram serving there is 240 calories, slightly above the average of other Talenti gelatos which is roughly 210-220. This is clearly not something you should eat frequently when counting calories. There is 26 grams of sugar, on the low side of Talenti ice creams (Sea Salt Caramel is a whopping 36 g), but a little excessive for my personal health guidelines. Both of these values are very close to Bryer’s mint chocolate chip ice cream, when adjusted by serving size weight, so there is nothing too unusual here. This product has a few qualifications that make it available to a wide group of people: vegetarian, gluten free, HFCS free, hormone free, and kosher. There are only 11 ingredients and all natural ones at that. Above all I am very impressed that there is no ‘natural flavors’, because that was present in their Mediterranean Mint flavor. The other differences between these two is that Peppermint Bark has added vanilla and oil (coconut and soybean), and peppermint extract is used instead of fresh mint. The latter explains the color difference between these two products. Because of the natural ingredients and fresh taste, this is now my 3rd favorite Talenti gelato, after Coffee Chocolate Chip and Caribbean Coconut. “Dutched chocolate” refers to chocolate processed with alkali, which gives it a browner color and milder taste. Its a pretty common process though I rarely see it listed as “dutched”, but rather as “processed with alkali”. Strictly speaking this is a “unnatural” process that I would like makers to avoid, but it’s a minor nitpick and not sure if how the replacement of natural chocolate would affect the flavor. 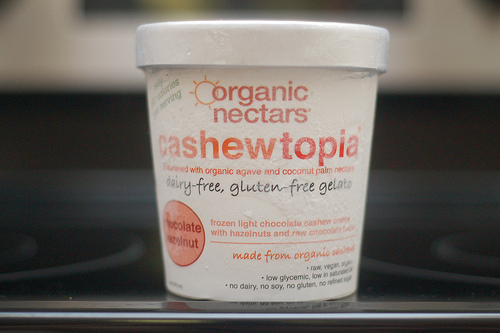 I purchased this ice cream at Publix grocery store for around $5.99 and haven’t seen it at any other stores in my area. The packaging is marked as “Limited Edition” so eat it while you can, but it seems to have been around since at least December 2012, making the odds of it suddenly disappearing less likely. This gelato is a mint-lovers delight with nothing unnatural and would be perfect if not for the excessive sugar and calories hidden within.